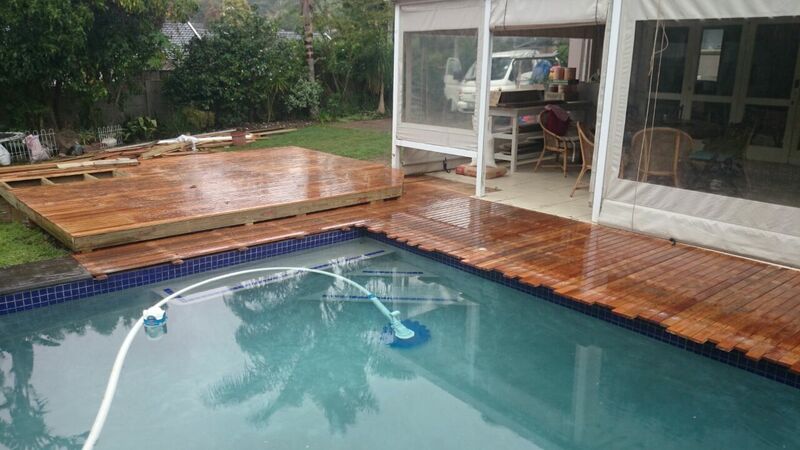 We built this wooden deck in Pinetown, Durban over a well so could not rest any joists on the well lid itself. 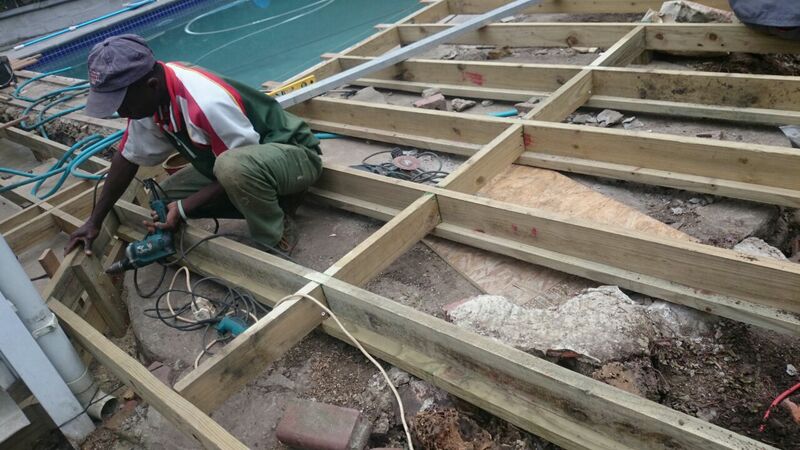 Normally we would have raised the height of the deck enough to use 50 x 228 as joists. 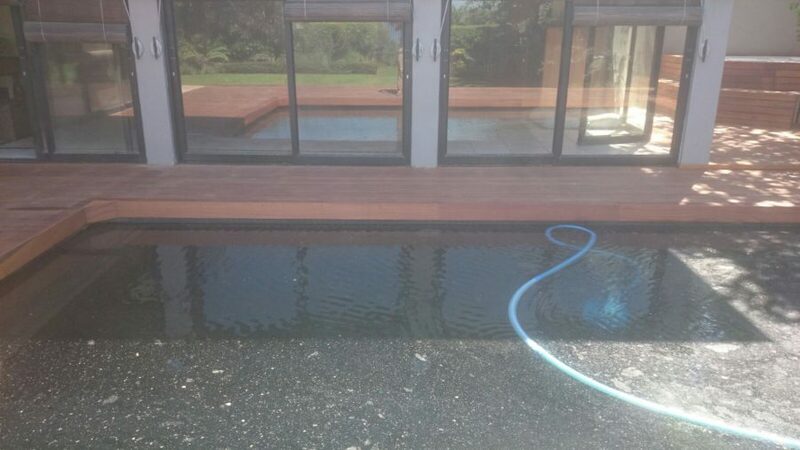 A 50 x 228 piece of wood can be spanned about 3m without any support below which would have solved our problem. 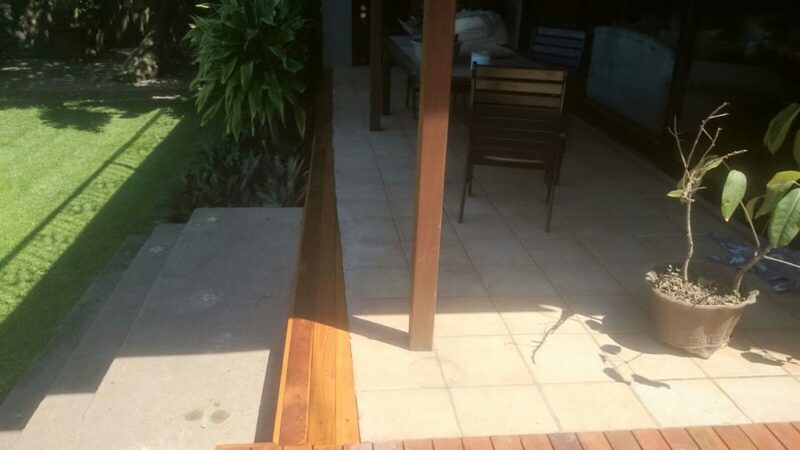 However we could not come up that far as that would have resulted in two steps from the raised deck level to the tiled area on the patio. 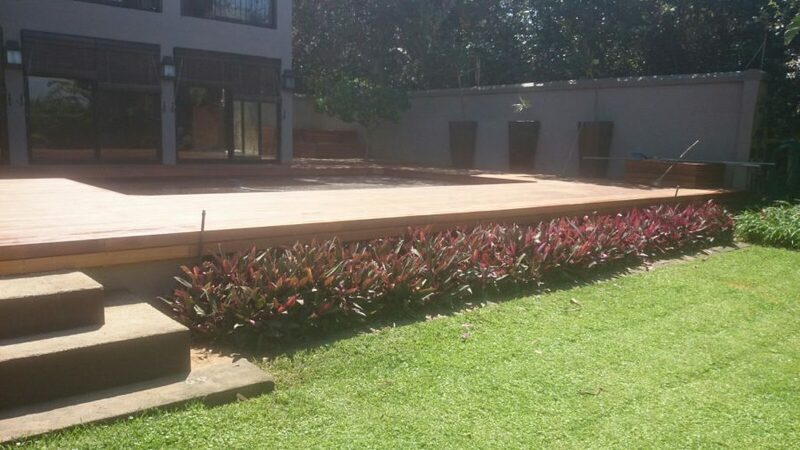 We used 38 x 152 stock as our joist material, compared to the normal 38 x 114 stock which we normally use. This allowed us to span up to about 2.2m which still wasn’t quite far enough to get over the well. 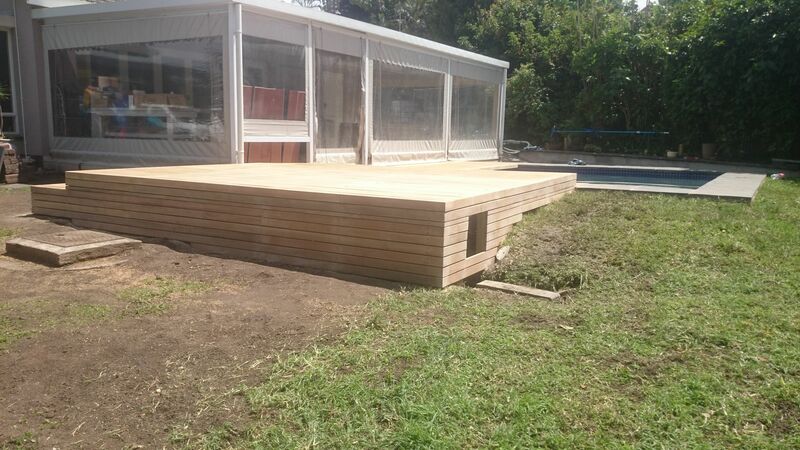 We brought the feet of the deck in as close as we could and placed them on top of the side wall of the well. 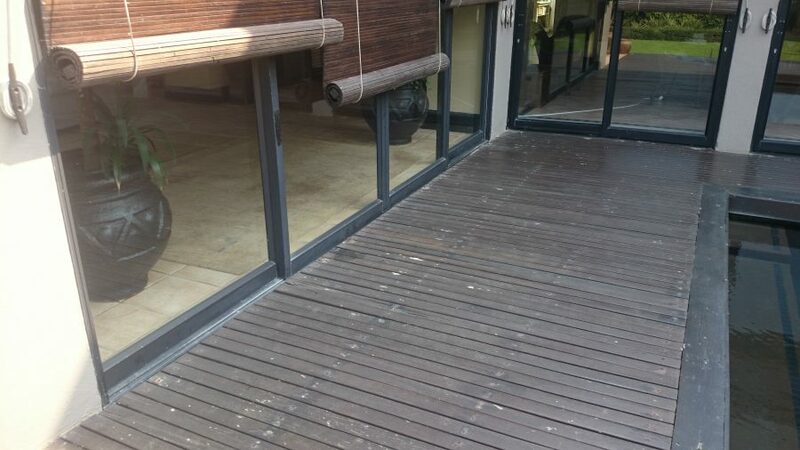 We also braced the deck in other places so as to stop any bouncing which would have occurred otherwise. 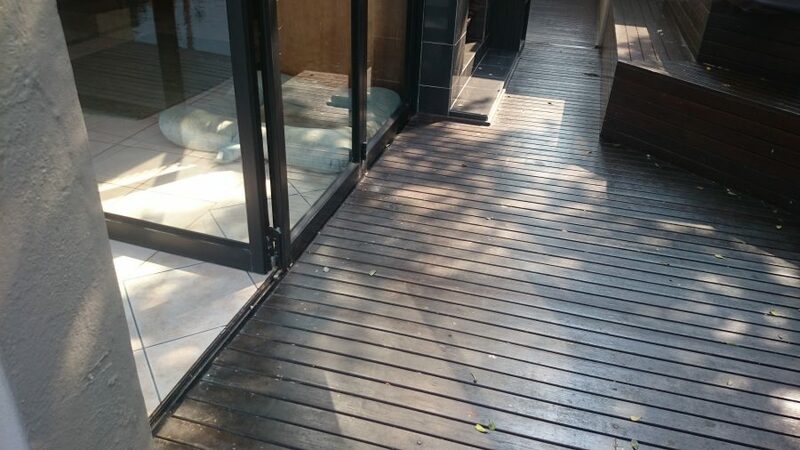 There was also a corner that we had to cut off so that it created a clear pathway from the lower deck around the awning upright and on to the tiled patio. 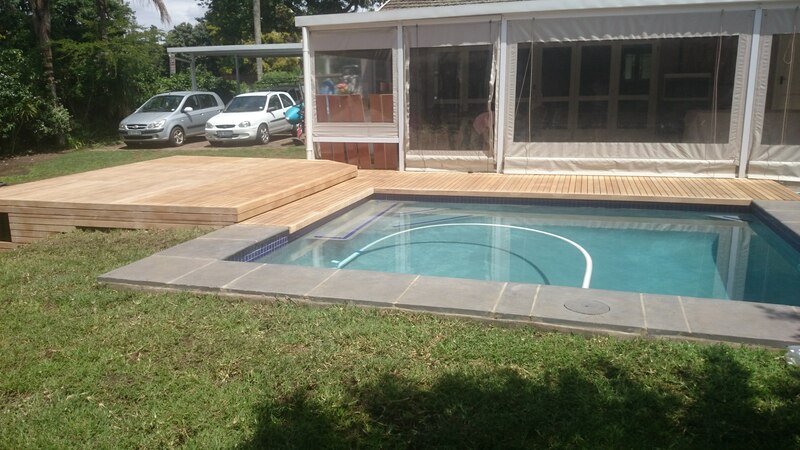 Half of the pool was built with pavers or coping stones on the edge of the pool and the other half had wooden decking. 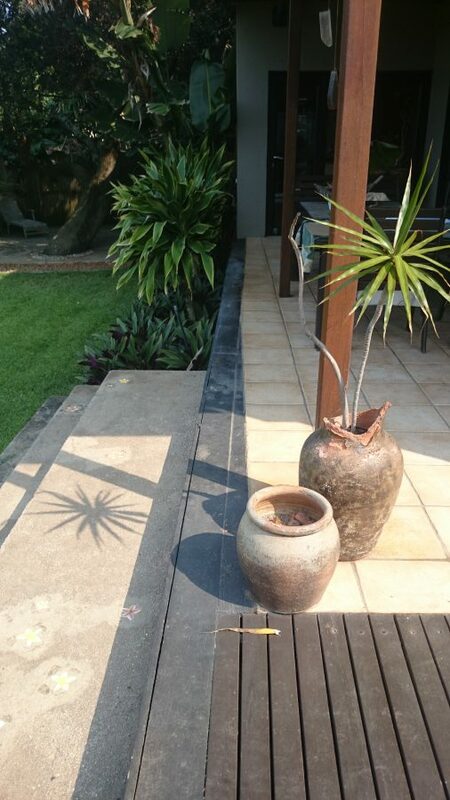 So we had to get all our levels right to create a seamless integration between materials. 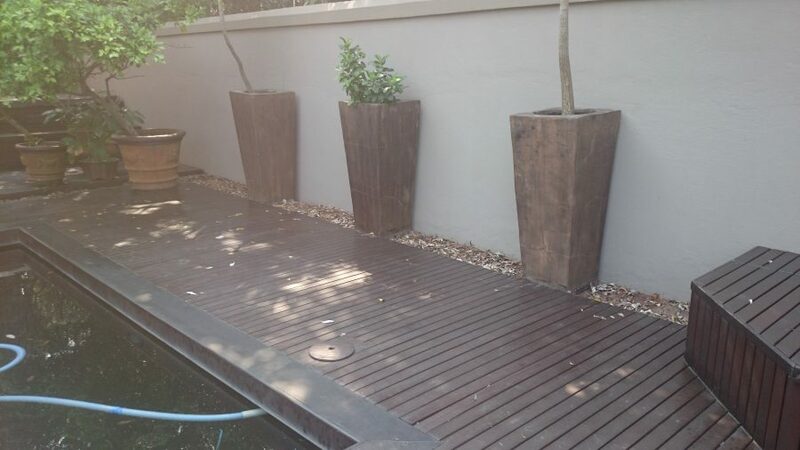 It is quite popular now to mix materials and have a combination of pavers and wood and grass. 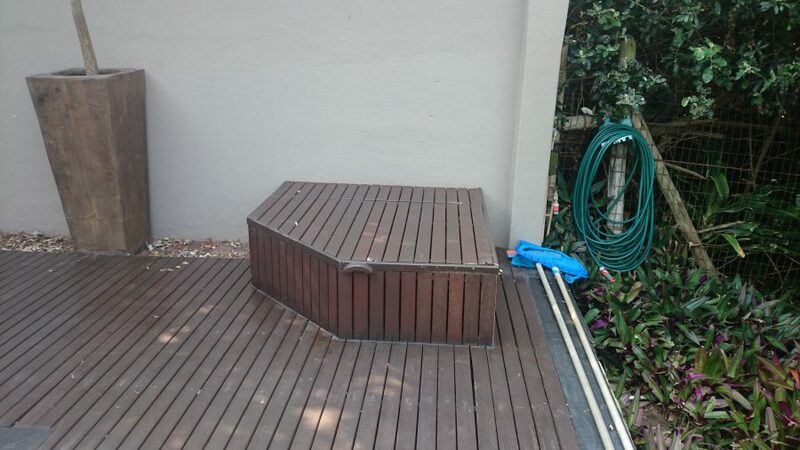 The pool pump was installed below the deck on the highest end and some trap doors were built on top of the deck to access the filters etc. We had to build a big enough trap door to allow a person to climb in there to change the sand or do other maintenance if needed. 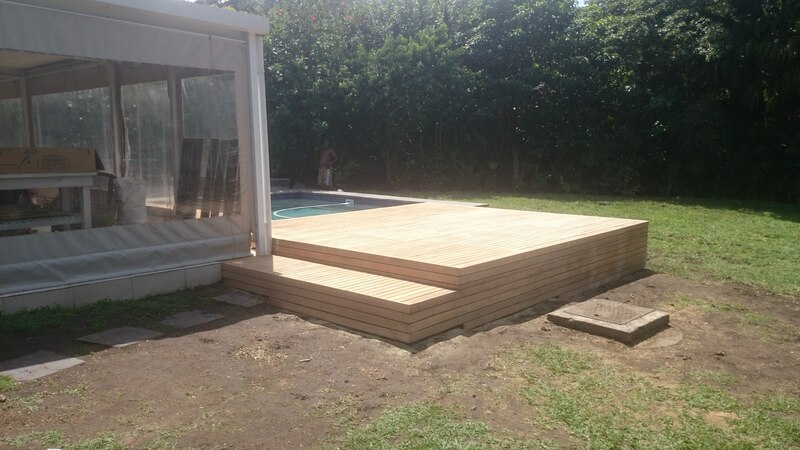 The sides were clad to block visibility underneath the deck and a full length step was built along the one side for access to the grassed area. A small opening was created on one side to house the pump DB board and this can later be hinged with a small door if the client wishes. 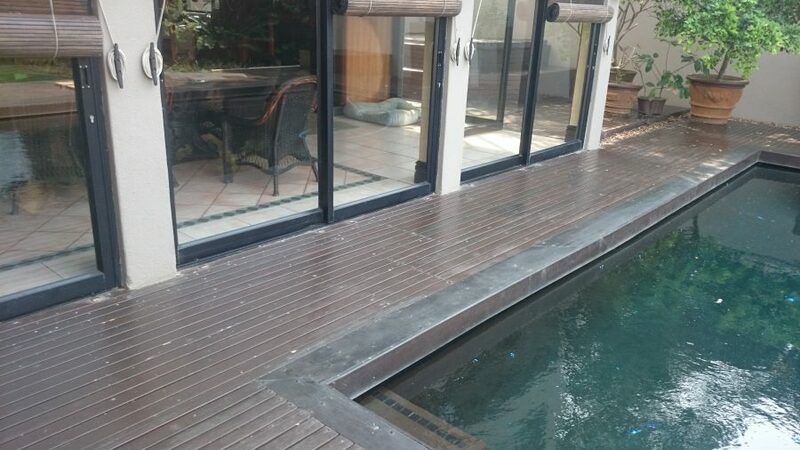 The challenges on building pool decks between a tiled area and the side of a pool is to get the deck boards to fit into the space you have been given to work with. 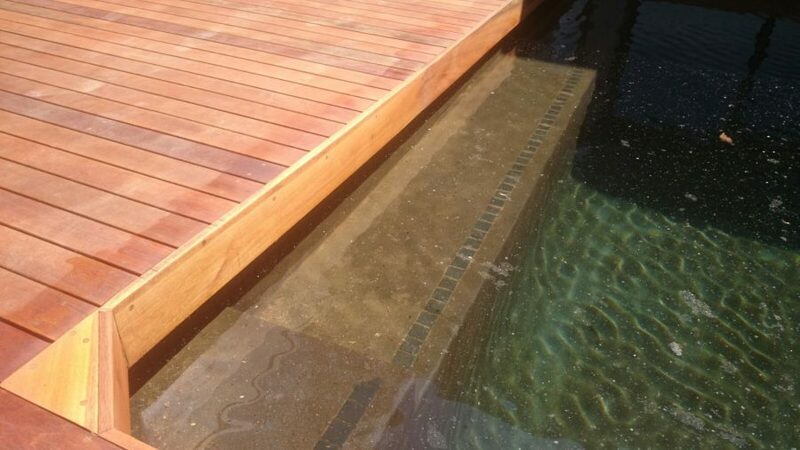 If the side of the pool isn’t 100% parallel to the side of the house, up to which you will deck, then you need to adjust the spaces between deck boards on one or both sides of the deck to either gain or lose space as you lay deck boards. 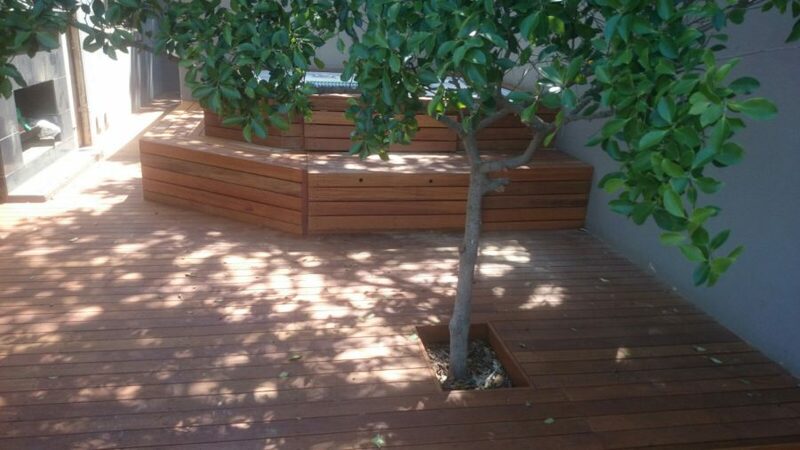 If for instance one side is 20mm wider than the other side, you will need to gain 1mm per row of deck boards in order to bring your deck boards parallel to the house so that you don’t end on a wedge-shaped deck board. At times this can be quite tricky. 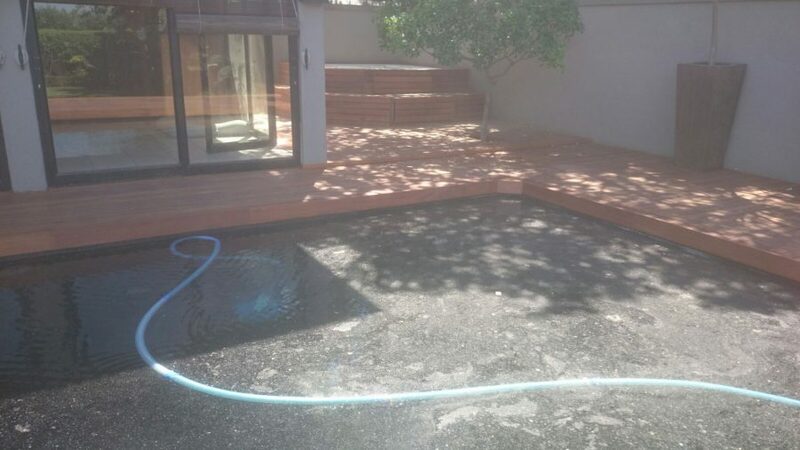 We are working on one in Hillcrest where the house and the pool paving is 77mm out of parallel. The total distance is only 2.4m. 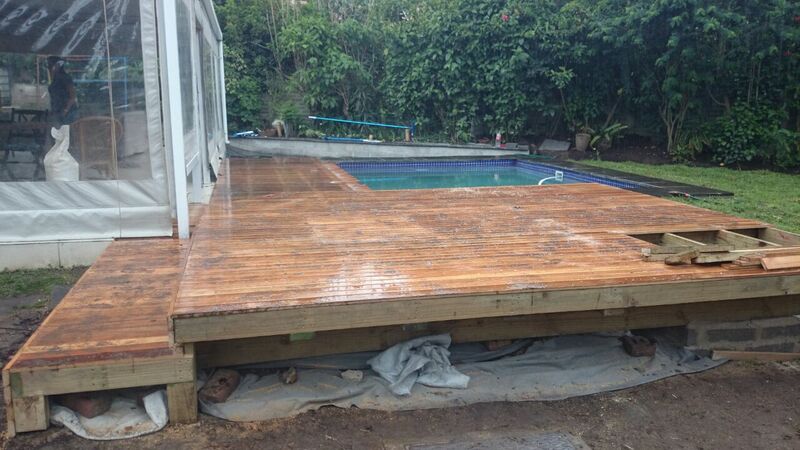 So the space will take approximately 32 deck boards to fill. 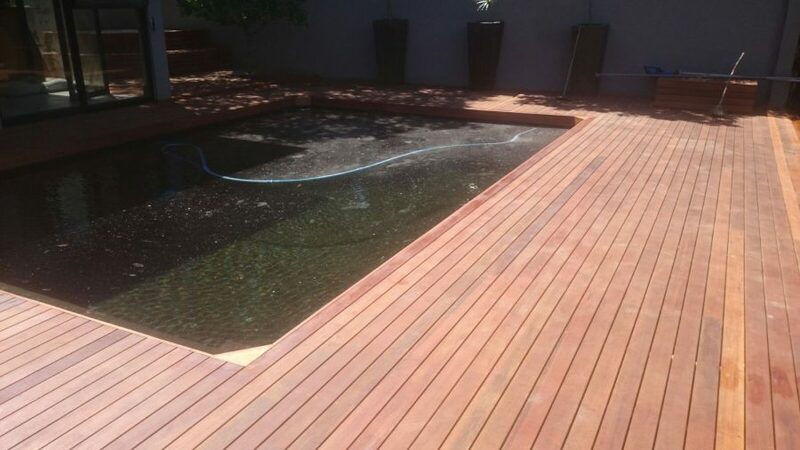 Which means we need to gain or lose more than 2mm per row of deck boards to bring the last deck board parallel to the side of the house (or pool depending on which side we start decking). 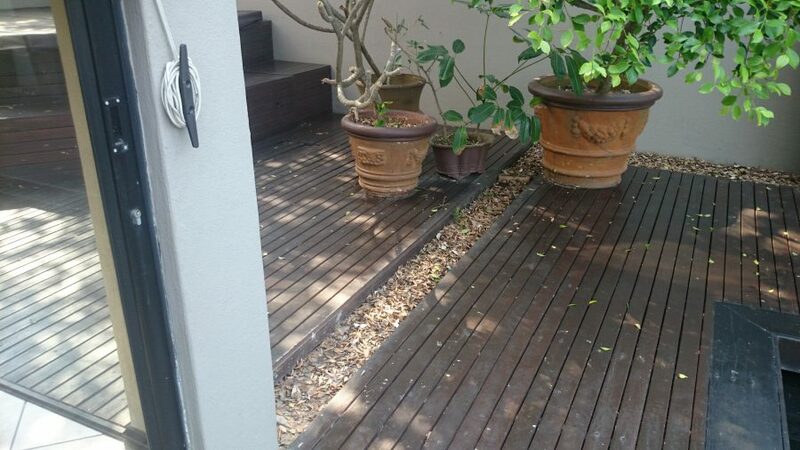 What we’re doing there is to increase the gap between deck boards to 6mm one side and reduce it to 4mm on the other side. 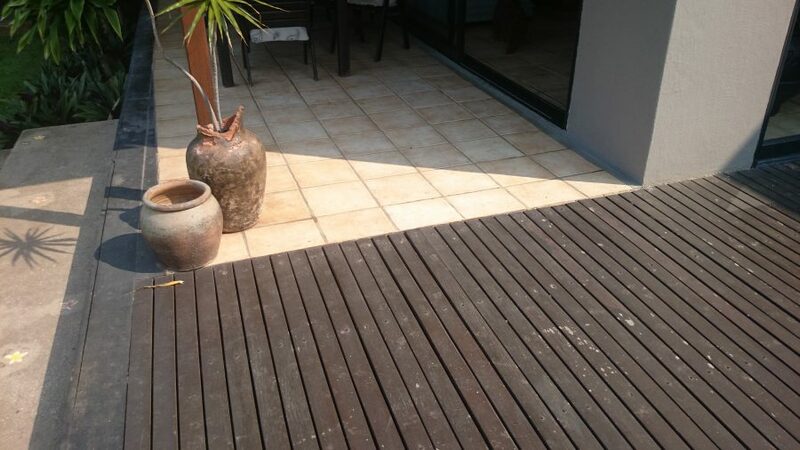 Then the last trick is to adjust your deck board spaces so that you don’t end on a half deck board. 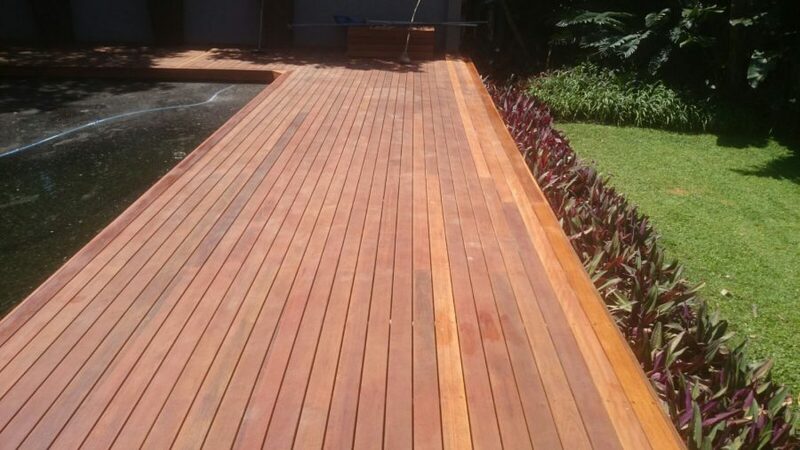 So once you are parallel you need to either reduce the gap tot 4mm or increase to 6mm to gain or lose space so you end on a full deck board. 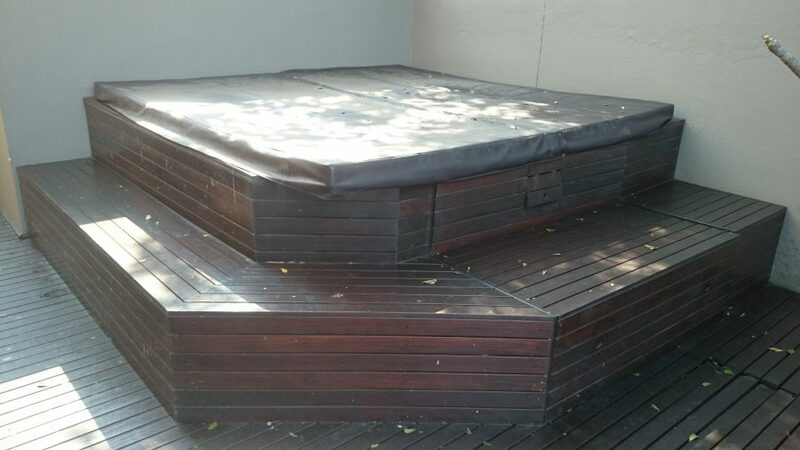 For a free no obligation quote on your wooden sun deck, balustrades, walkways, pergolas, screens and other timber construction, please call us on 031 – 762 1795, or use the contact us form below.